It’s that time of year! You know what I’m talking about. As the new year approaches, we start making resolutions. We decide what changes we are going to implement in our lives. However, many times we are gung-ho while declaring our resolutions, but after the clock strikes midnight on January 1st, nothing happens. Or, by January 15th, the resolution fizzles out and we go back to the former status quo. Sound familiar? If so, you are not alone. Research shows that more than 80% of people fail at keeping their resolutions. The dictionary defines a resolution as “a firm decision to do or not to do something.” Resolutions made for the new year are typically promises or statements to live a better and fuller life. They require making a long-term change and putting effort into maintaining them. 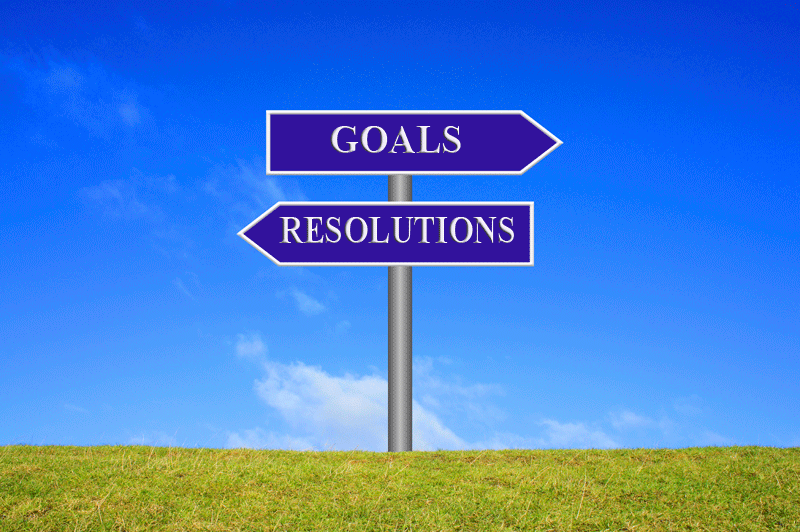 Rather than new year’s resolutions, what if you set realistic goals? The dictionary defines a goal as “the object of a person’s ambition or effort; an aim or desired result.” A goal is a target that a person wants to reach. It has an end-point where a person can see herself after a certain period of time. A goal can be short term or long term. Setting a measurable goal can ultimately create transformational change in areas of your life where you feel stuck or you have a strong desire to move forward. So, what if you could finally lose those 25 nagging pounds? What would it mean to you if you could pay off the five-figured accumulated credit card debt? Or, what if you could finally carry out your passion in a career that you love? Know what is important to you. Your goals should fit within your priorities. Write down your goals and post where you can read them daily. Research shows that you are 42% more likely to achieve your goals by writing them down. Some people will post goals on mirrors and read them during the morning routine. Others may keep them in a journal, a Bible, or on their cell phones. But their daily routine includes reading the goals. Your goals should be measurable and specific. In order to track and achieve your goal, you need to have a measurable target in mind. You must be able to measure what you are managing. Deadlines create urgency and help you balance your workload. You need to establish a time framework, keeping in mind you may need to be flexible. Let’s face it…stuff happens. Step outside your comfort zone and challenge yourself. If you stay within your comfort zone, nothing great or transformational will happen. A goal should move you forward and while accomplishing awesome things. Knowing why your goal is important to you will be more energizing and motivating. Limit your number of goals. You should set 7 to 10 goals for the year. Focus on 2 or 3 goals at one time. Once you accomplish those, then move on to your next goals. Have an action plan for each goal. Break down your goals into bite-sized pieces. However, be careful not to over analyze or plan excessively. Tracking your progress will help you maintaining momentum. Make sure your tracker is visible and you review it regularly. Ask for help when you are stuck. Seek resources if you are not moving forward. You may need a coach to help you establish and achieve your goals. A coach can also help you overcome obstacles. Have an accountability partner that you report to on a regularly basis. Build a support system. Lose 35 lbs by June 1, 2017. Add 4 new clients increasing revenue by 40% by the end Q2. Have one date night weekly with my husband. Take my family on vacation for one week by July 1, 2017. What are your goals? Which of these tips stand out for you? Share your thoughts in the comments below.